The Vita-Prep… This One is for Food! With the ability to chop, grind, puree or blend dense ingredients at the exact speed, the Vita-Prep offers unparalleled commercial kitchen versatility. That’s right, the Vita-Prep’s 2 peak output HP motor allows you to whip up amazing guacamole, salsa, bisque’s and more with the simple flick of a button. Variable speed control also allows for flexibility and creativity while maintaining the integrity of your ingredients and a patented accelerator tool allows for easy control and processing of dense ingredients. Vitamix also offers the Vita-Prep 3. From chopping delicate ingredients to blending tough purees this food preparation machine is the only tool you’re kitchen will need to perfectly chop, grind and blend it all. The Vita-Prep 3 contains an advanced cooling fan for optimum reliability during peak hours of operation so that you do not burn out your motor. Warranties are always important selling points when investing in expensive commercial equipment. The Vita-Prep and XL comes with a standard three-year limited warranty on motor and base parts and a one-year limited warranty on parts and labor of the full unit. 54 page recipe and technique guide. Extra blending capacity for both hot and cold ingredients. Pulse function and variable speed control allows for flexibility and creativity. When volume, consistency and quality are essential, Vita-Prep is perfect in even the busiest of kitchens. Here are just a few of the top reasons why Vitamix’s value exceeds its initial expense. Name Brand Recognition… Making high-quality blenders for over 90 years, Vitamix is a world leader in foodservice blending products. Their machine can be found in 90% of coffee shops and 87% of smoothie shops. Lowest Total Cost of Ownership… While more expensive to purchase than other blenders, Vitamix has the lowest total cost of ownership. Their products are built to outperform and outlast any other blender on the market. With proper maintenance, couplings, blades, the motor and other parts have a longer life expectancy and are also less expensive to repair. Quality of Blend… Unlike other blenders, Vitamix’s specifically designed ice blades, the container design, and motor horsepower offers a thorough blend the first time every time. producing a quality blend each time. With a variable speed for perfect purèes, savory soups and delicious frozen treats. The Vita-Prep 3 is a must in kitchens where volume and quality are key ingredients to a successful back-of-the-house. Noise Management… Load blenders can be a turn off for many customers. “The Quiet One” by Vitamix is the quietest blender on the market and used at international coffee shops like Starbucks. Other Vitamix Blenders come with a noise reducing cover for improved customer experience. Custom Programmability and Support… Nothing is worse for a customer than when they go back to a restaurant for their favorite drink only to have the consistency far different than the last time they had it. With a Vitamix, you’ll have consistent drinks even if you have more than one location. Outstanding Warranty… Vitamix offers a 3 years parts and 1 year labor warranty on all commercial blenders, that does NOT include cycle count. So if you are looking for a high quality commercial blender with exceptional customer support and warranty program, in our educated opinion, Vitamix is a high contender. We might think that Vitamix Blenders are the coolest kitchen gadget to grace this fine Earth, but surprisingly not everyone knows what a Vitamix Blender is. So here’s a little history and information to familiarize you with Vitamix. In 1937 W.G. “Papa” Barnard developed the first Vitamix Blender. Twelve years later Papa Barnard took his invention to a TV studio to create the first infomercial. The commercial ran for several years which helped make Vitamix a household name. The company’s main goal continues to be giving people a machine that does more than just blend. Today, the company makes 3 different types of blenders to appeal to the wide variety of businesses- a Beverage/Bar Blender, a Food Preparation Blender and Mix’n Frozen Treat Machine. Each machine also comes with different options and there is a commercial as well as residential line. Although considered a high end product, Vitamix is definitely an amazing blending machine and worth the investment. What Can I Make with a Spring Form Pan? We all know that cheesecake gets its perfect circular shape with even edges from a Spring Form Pan, but there is a lot more that can be made with this pan. 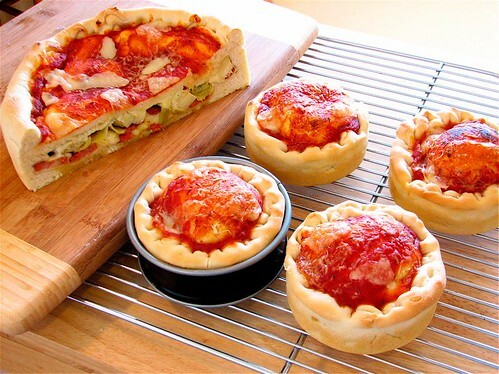 Deep Dish Pizza…. Have a hankering for Chicago-Style Deep Dish Pizza but are no where near the Windy City? Or maybe you want to recreate your favorite Deep Dish recipe for your customers. Either way, you can easily create that perfect deepness and shape with a Spring Form Pan. Since the pan comes in various sizes you’ll have great flexibility in how large or small your pizza is. American Spaghetti Pie.… Your customers will get a kick out of this Spaghetti idea! In essence this is a unique way to prepare spaghetti casserole. To make single servings, we recommend using a 6″ Spring Form Pan. Gardening… Yes, you can even use a Springform Pan for gardening. Fill the pan with soil and plant a few bulbs in there and watch them grow. Start with placing a plastic liner on the bottom of the pan to avoid leaks when watering. This is a great idea for tulips and hyacinth flowers.